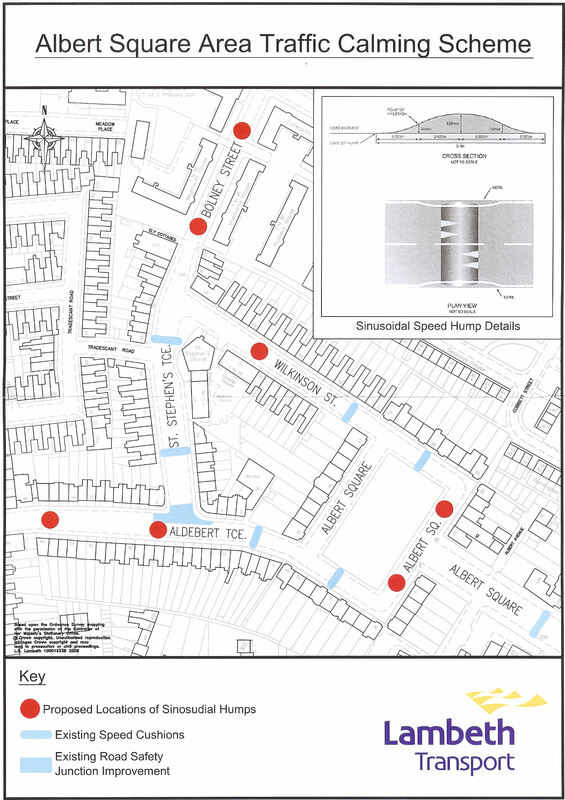 Residents in the Albert Square conservation area should have today received updated consultation material from Lambeth Council about the proposals for traffic calming measures in the area. The last meeting of the Albert Square and St Stephen’s Association (ASSA) Committee considered these and came to the following conclusions, which we hope will assist you in making a response to the proposals (the closing date is now 17 October). There is an existing 20mph speed limit through our area – though you would hardly know this because of the lack of signs and road markings. This limit needs to be more vigorously signed and enforced. For example, a census of traffic through our area a year ago found that in excess of 1,000 vehicles a day were passing through the area, with average speed of 22mph and 15% were travelling at speeds of more than 26mph. We welcome Lambeth Council’s attempts to tackle traffic calming in the Albert Square conservation area, but call on them to withdraw this scheme in favour of further consultation with residents to introduce more effective longer term solutions to reduce the volume and speed of traffic in our area.